..this is a tough one - I've lived in the area all my life, but couldn't say from memory whether this one was here in 1960 or not. I neglected to grab a pic of the tower while I was at the nearby tri-station to review, but the USGS topos indicate 2 towers in the immediate area & Google Earth images seem to show the coordinates spot-on w/ the base of the current tower. The 1960 NGS description seems to imply that there is only one tower at this location & the height of 505 feet seems about right. The topo info may be based on pre-1960 info ...I'm leaning toward a 'found' but will have to do some more research.. I have only been living in this area since 1980. So I did not know this was not the original tower until I read MLoser's report. I deleted my original find from 2002. I am torn about this one. I am almost certain this is not the tower originally described, as there is a lot of evidence of changes at the site, the most evident being new cable support foundations. This would suggest a different tower was erected at some point, and possibly in the last few years. However, I drove the whole way up to it so I am claiming it! After learning some more I realize that this is a Not Found or Destroyed. I will submit to NGS that the tower is different than the original description. The tower, taken from benchmark Joan, KW3127. The top of the tower, since after all, that IS the station! 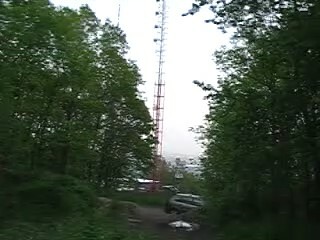 DESCRIBED BY COAST AND GEODETIC SURVEY 1960 (JCC) THE STATION IS THE RED LIGHT AT THE APEX OF THE WTPA TV STATION MAST. LOCATED ON LITTLE MOUNTAIN, ABOUT 5-1/2 MILES NORTH OF HARRISBURG AND 1-1/2 MILES NORTHWEST OF ENOLA. IT IS A TRIANGULAR STRUCTURE, CONSTRUCTED OF LACED STEEL CHANNEL IRON, SET ON A SWIVEL BASE MOUNTED ON A LARGE 5 X 5 FOOT CONCRETE PIER, AT THE APEX OF THE TRIANGULAR STRUCTURE IS MOUNTED A POLE TYPE MAST WHICH AS A RED FLASHING LIGHT MOUNTED ON TOP. THE STRUCTURE IS PAINTED ALTERNATELY ORANGE AND WHITE WITH AN OVERALL HEIGHT OF APPROXIMATELY 505 FEET. RECOVERY NOTE BY LOCAL ENGINEER (INDIVIDUAL OR FIRM) 1970 (JEP) THE STATION IS THE RED LIGHT AT THE APEX OF THE WTPA TV STATION MAST LOCATED ON LITTLE MOUNTAIN,- THIS IS THE WRONG MOUNTAIN AND SHOULD BE BLUE MOUNTAIN AS LITTLE MOUNTAIN IS THE NEXT MOUNTAIN TO THE NORTH. 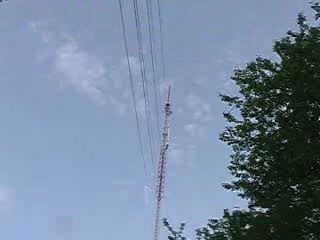 WOULD ALSO BE PRATICAL IF THE PORTION OF DESCRIPTION OF TRIANGULATION STATION DESCRIPTION JOAN WOULD BE ADDED TO REACH THE TV STATION WTPA TOWER (MAST), AS THE TOWER IS LOCATED ABOUT 350 FEET SOUTH OF JOAN. RECOVERED BY GANNETT FLEMING CORDDRY AND CARPENTER INC., CONSULTING ENGINEERS, P.O. BOX 1963, HARRISBURG, PA. 17105.